It would be great to be able to be outdoors near a river, lake, or ocean where you could view nature and fish up close. Of course, you would need several camping gear items, such as tents, poles, sleeping bags, and a dry bag which is used for keeping your electronic devices and other things dry when you are near water. However, since camping next to a river or lake isn't always possible, a great alternative for viewing aquatic animals and plants up close is to set up a home aquarium. This allows you to see a variety of fish and aquatic invertebrates up close and learn about their behaviors. Setting up an aquarium can be fun and exciting. However, there are many decisions that need to be made, such as what kind and size of tank, saltwater or freshwater, what kind of accessories you will need, and where to place the aquarium. What Size Aquarium Should You Get? It is best to buy the largest tank that you can afford and have room for. This is because larger aquariums will have a greater surface area for the exchange of oxygen and carbon dioxide and also waste products from the fish will be more widely dispersed in a larger body of water. Larger tanks are also less likely to have wide temperature fluctuations. Tanks that are at least twenty to thirty gallons are best, although you can successfully keep fish in smaller tanks, such as a ten gallon tank. Of course you can keep more fish in a larger tank than you can in a 10 gallon or smaller tank and the water quality is easier to maintain with a larger tank. The shape of the tank is also important. Rectangular shapes are best because they provide the largest surface area. The worst kind of aquarium to buy are those that are taller than they are wide because the surface area at the top of the aquarium is too small for the volume of water. It used to be that all you could find were glass tanks, but now these seem to be harder to find than acrylic tanks. There are pros and cons for each type. Acrylic tanks are lighter than glass and are less likely to leak than glass tanks because the corners of acrylic tanks are seamless. However, acrylic tanks scratch much more easily than glass tanks do. Glass tanks are also less expensive than acrylic tanks. I recently bought an acrylic tank and so far the fish in the tank seem very happy and so it really doesn't seem to matter to the fish what type of tank you get. However, even being very careful with the tank I noticed a few scratches on the front of the tank within two weeks of getting it. Where Should You Place Your Aquarium? You will need an aquarium stand to place your tank on. Aquariums that are filled with water are very heavy, so don't try to place your aquarium on regular furniture because the weight of the tank may be too great. You can buy aquarium stands for all types and sizes of aquariums and you will need to buy a stand specifically made for holding aquariums. You'll also want to have it somewhere near an electrical outlet so that you can plug in the accessories, such as the heater and filter. You'll need to be careful not to overload the outlet with more appliances than it can handle. You will also want to be careful that the outlet doesn't come into contact with water from the aquarium. Sometimes water from the aquarium will spill out and follow the cord right down to the outlet. Follow the directions that are given on the accessories to prevent this. Usually they suggest creating a drip loop so that if water does leak out of the tank and down the cord that it drips off of the loop and not into the outlet. If your outlet is located at a higher level than your aquarium then you won't have to worry about this. If this is your first aquarium then you may want to set up a freshwater tank. Freshwater tanks are much easier to maintain, and the fish are less expensive too. In addition, it is more difficult to maintain the proper water conditions in a saltwater tank than in a freshwater tank. In general, it is easier to begin with a freshwater tank, however, even if you are a beginner it isn't impossible to succeed in setting up a saltwater tank. If you are interested in setting up a saltwater tank please see the article Setting Up a Saltwater Aquarium. After you have your tank set up with the water in it and with the heater and filter running you'll need to let it sit for at least 24 hours before adding fish. 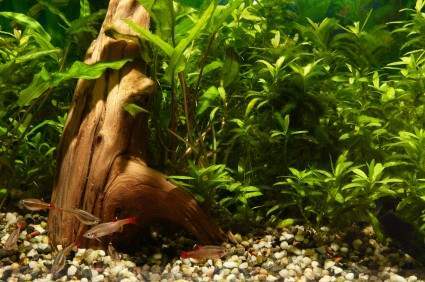 You can also speed up the efficiency of the biological filtration system in your aquarium by adding some nitrifying bacteria by using a product such as Bio Zyme or Stress Zyme. The bacteria in these products help to convert toxic ammonia and nitrite levels from fish waste to nitrate, which is used by aquarium plants as food. In time, after your fish are added these bacteria would be present anyway, but using one of these products will speed up the process.